When the first time I arrived at the venue, I noticed ce Mindy and Sabrina, and I can't recognized the others bloggers. Looks like our community have become larger and now we have so many new bloggers. I asked ce Mindy about their name (she is the only one that know everyone because she is always attend beauty event at Surabaya hehehe). The event took place at Matahari Dept. Store. The decoration is very colourful and suits the theme very well. 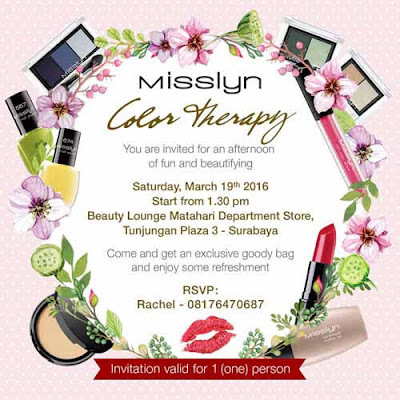 The theme for this event is "COLOR THERAPY", which means you can use colour make up depending on your mood. The event basicly only a simple meet up between Misslyn team and Surabaya Beauty Bloggers. The last time they made an event is almost 2 years ago, when the first time Misslyn enter Surabaya's market. The spokeperson (ce Anna) tell us about Misslyn (some of us also didn't really knew about this brand before). She also explain about Misslyn products. They have many varians from Eye, Face, and Lips make up. And also many color selection of nail polish. After some explanation about the brand, we played Face Charts Game. Here, we were given a blank face chart and we need to use our skill to make this plain lady looks more beautiful. I'm not an expert when it comes to face chart. Plus this one printed on normal A4 paper, so it's quite hard to blend the color hikz. I made mistake with the nose contour, can't erase it and too lazy to start again with a new paper. hahaha. Now into the goodie bag! A super cute hamper! We were give a mason jar filled with 3 Misslyn products (too bad I've already have the same color for the lipstick.. read my review about it here) and also a voucher. With the voucher, I bought another lipstick and lip liner.